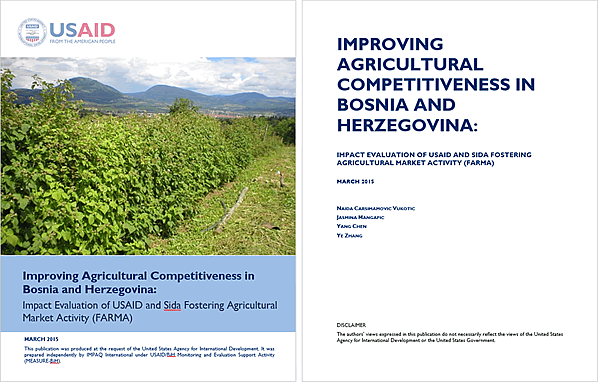 Impact Evaluation of the Fostering Agricultural Markets Activity (FARMA) is the first rigorous impact evaluation of an USAID/BiH intervention ever conducted. FARMA was a five and a half year $22.2 million intervention launched in September 2009 and co-financed by USAID and Swedish International Development Cooperation Agency. It provided technical assistance to farmers in Bosnia and Herzegovina (BiH) in targeted sub-sectors (dairy, fruits and vegetables, and medicinal and aromatic plants and honey) through a demand-driven approach aimed at improving the competitiveness of BiH’s agricultural products. FARMA worked to expand environmentally sustainable production, processing, domestic sales, export sales, and the production of value-added products. Providing USAID/BiH with empirical evidence and information that could inform future funding decisions and program designs. What were the impacts of FARMA interventions on beneficiaries’ sales and exports? Did the impacts vary by sub-sectors? What were the impacts of FARMA interventions on beneficiaries’ access to finance? Did the impacts vary by sub-sectors? What were the characteristics of the beneficiaries served by the FARMA program? How were FARMA interventions implemented? What were the main challenges to implementation and how could these challenges be addressed? What were the stakeholders’ perceptions of the model of joint financing of FARMA by two donors? We designed a quasi-experimental evaluation which combines BiH administrative data with FARMA Activity M&E data, and estimated the FARMA impacts through multivariate regression analysis based on a difference-in-differences approach. We also supplemented impact analysis with an in-depth qualitative implementation study to uncover the mechanism through which FARMA generated impacts on beneficiaries. The implementation study enabled us to interpret the impact results and to descriptively explore which FARMA interventions likely were the key drivers of development impacts.